In the ultra-competitive world of destination entertainment, getaways can’t take a gamble on maintaining the status quo. 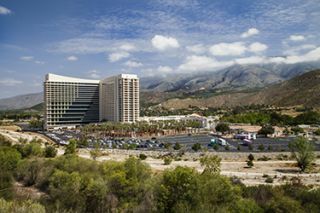 That’s why Harrah’s Resort Southern California (HRSC) has just made a major AV upgrade to its facilities, establishing itself as a technology leader in the process. Renovations and accompanying AV upgrades touched virtually every aspect of HRSC. Areas where Sound Image was pulling wire included the pool and its lazy river attraction, poolside restaurant, bar, lobby, “restaurant row” with the likes of Starbucks and Earl’s Sandwich Shop, and of course the Events Center—a 23,000-square-foot banquet hall that doubles as a 2,200-capacity concert venue hosting the likes of Soul Asylum, Everclear, Jerry Lee Lewis, the Under the Sun Tour, and more. A common theme throughout the various spaces was significantly improved audio quality. To that end, a notable addition to the facility was a range of systems from L-Acoustics, including 18 K2 variable curvature WST line source speakers in the Events Center—the world’s first install of the K2. With the HRSC Events Center, Sound Image was faced with a square box that needed to sound excellent for concerts, in any of three possible configurations: half the room, the whole room without stadium seating, or the whole room with stadium seating rising almost all the way back to the ceiling. Sound Image conducted the world's first install of the L-Acoustics K2, comprised of 18 K2 variable curvature WST line source speakers in Harrah's 23,000-square-foot Events Center. Not to be outdone, video has its share of highlights at the casino resort. Upon entering the lobby, visitors are greeted with an impressive 4x4 video wall made up of 16 GPO US 46-inch monitors. Meanwhile, TV s throughout the casino are set up for maximum flexibility, with many of them able to accept input from CastNET digital signage, satellite, and/or cable.